Four statues have been discovered underneath a 700-year-old pagoda in Viet Nam’s Quang Binh province. 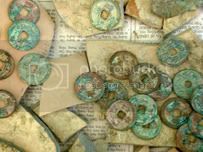 14 July 2007 (Thanh Nien News) – More news of Chinese Tang Dynasty coins unearthed in Vietnam, again in Quang Binh Province. Similar Tang Dynasty coins were found earlier last week by a rice farmer. Thousands of coins from Chinaâ€™s Tang Dynasty era, believed to date back to the 8th or 9th century, have been found in Vietnamâ€™s central Quang Binh province. Three refuse collectors found five jars July 11 containing the coins and weighing around 30 kilograms in Ham Ninh commune. At the same place a week earlier a local farmer named Nguyen Duc Dung found a pot weighing 20 kilograms containing copper coins while digging on a rice paddy. On all the coins one side has four Chinese characters while the other is plain. Read more about the Chinese coin finds in Vietnam. 07 July 2007 (Nhan Dan) – A pot filled with copper coins dating to the Tang dynasty (7-10th centuries AD) was found by a farmer in North Vietnam. Up to the 11th century, much of Northern Vietnam was part of imperial Chinese territory. A scrap metal collector has struck treasure in the central coastal province of Quang Binh, with a find of centuries-old Chinese coins believed to date back to the Tang dynasty of China. Nguyen Duc Dung from Le Thuy district, discovered the pot of copper coins as he was digging in a rice field on July 5. Most of the coins are clearly engraved on one side with four letters from ancient Chinese scripts of the period with the other side left clear. Provincial museum Director Tran Anh Tuan said the design showed that the coins were probably minted in the 8th â€“ 9th centuries. â€œThese coins were found in Quang Binh province because the money was circulated into Vietnam for trading during the heyday of the Tang dynasty,â€ said the artifact expert. Dung uncovered some 20 kilogrammes in total which he sold at VND 200,000 (US $12.5) per kilogramme. 29 May 2007 (Nhan Dan and Thanh Nien News) – Never-before-found glass jewelery have been found in Central Vietnam, dating to the 9th and 10th centuries around the Champa period. A museum in Vietnamâ€™s central Quang Binh province announced Tuesday it has found glass jewelry made during the Cham Civilization dating back over ten centuries ago. The General Museum said the beads, bracelets, and other items were found in Le Thuy districtâ€™s Son Thuy commune. Read more about the rare Champa glassware.